We live in a very complex universe, and as far as one can remember, men have always wanted to know everything about it: where do we come from? what is our world made of? To answer these questions, sciences were developped, and among them, theoretical physics: using mathematics to describe certain aspects of Nature. From Isaac Newton’s mechanics and classical field theory to Einstein’s relativity principle and quantum mechanics, a large variety of the components of our universe have been studied back and forth and a vast scope of physical phenomena can be explained with what we call fundamental forces. What is a force? What defines those fundamental forces? With this brief introduction, we will try to figure out under which forms these forces exist, how they are linked to each other. Finally, we will talk a little bit about theories trying to unify these different notions of forces, like string theory for instance. I have a question: what is a force ? A force is what changes or tends to change a state of rest or motion in an object. Force causes objects to accelerate, change direction, or change shape among other things. For instance, when you push an object, you exert a force on it. Another example, when you blow on a feather, you exert a force on it. The most puzzling and intriguing moving things visible to humans have always been the sun, the moon, the planets and the stars we can see in the night sky. Newton created a mathematical model that not only described the observed motions of planets and stars. His model also described the motion of swinging weights and falling apples (like the one he received on his head while taking a power nap! ), through one concept: the gravitational force. 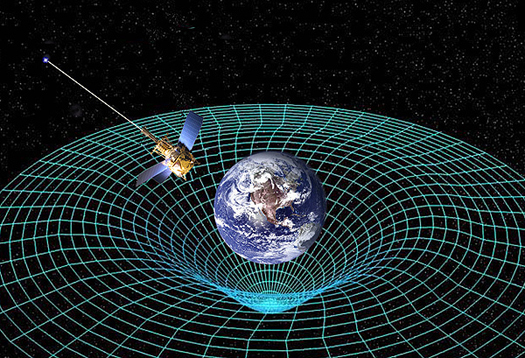 What is the gravitational force? Well, it is quite simple: objects that have mass pull on each other, but in a way such that they never push each other apart. On what depends this force ? First, it depends on the masses of the two objects: the greater the mass, the greater the intensity of the force. Second, it depends on the distance between these objects: the smaller the distance, the greater the force. This is what makes everything on Earth stick to it, and this is also why the Moon revolves around the Earth and why the Earth revolves around the Sun. In Newton’s model, gravity is an instantaneous force: it means that every objects exerts instantly a gravitational force on the other. In other words, there is no delay before you undergo gravity. According to the current understanding of physics, forces are not necessarily transmitted directly between objects, but instead can also be transmitted by intermediary entities called fields. Among the most famous scientists in field theory, Maxwell stands out with his theory of electromagnetism. In 1820 Hans Christian Orsted discovered that electric currents exerted forces on magnets, while in 1831, Michael Faraday made the observation that time-varying magnetic fields could induce electric currents. Until then, electricity and magnetism had been thought of as unrelated phenomena. In 1864, Maxwell published his famous paper on a dynamical theory of the electromagnetic field. This was the first example of a theory that was able to encompass previous separate field theories (namely electricity and magnetism) to provide a unifying theory of electromagnetism. Before Einstein, some scientists tried to measure the relative speed of light by measuring the speed of starlight arriving to Earth. The problem they had was that no matter which direction Earth was moving towards, the measurements were all the same! So what did Einstein do? Einstein said this happens because there is something unexpected about distance and time. He thought that as the Earth moves through space, our clocks slow down. Any clock used to measure the speed of light is off by exactly the right amount to make light seem to be moving at its regular speed. Also, Einstein said that as the Earth moves through space, our measuring devices change length. So, any measuring device used to measure the speed of light is off by exactly the right amount to make the starlight seem to be moving at its regular speed. Einstein managed to unify our notions of space and time into an entity we now call spacetime. In 1907, he stated that without the presence of matter, the universe would be made of a flat fabric. But in the presence of matter, like the sun, gravity propagates at the speed of light and causes the fabric of the universe to curve itself following 4 dimensions (three of space and one of time). This statement was the principle of general relativity, and expands the idea of special relativity. Among other results, Einstein stated what probably is the most famous equation in the world (alongside 1+1=2) which is …..E=MC2! Wow, four dimensions, but was it verified ? Yes ! In 2011, the NASA launched a satellite to verify the geodesic effect, which is the warping of space and time of space caused by the presence of a gravitational body, the Earth in our case. So now, we have seen that Newton was wrong: gravity was not an instantaneous force, but instead is a force propagating through a field, making space and time curve! Nice, isn’t it? To keep it simple, quantum mechanics is the science of the behavior of things at an atomic level. Quantum is a Latin word that means ‘how much’. So a quantum of energy is a specific amount of energy. In 1690 Huygens theorized that light was composed of waves, while in 1704 Newton explained that light was made of particles. Experiments supported each of their theories. However, neither a completely-particle theory nor a completely-wave theory could explain all of the phenomena associated with light! So scientists began to think of light as both a particle and a wave. How can something be both a particle and a wave at the same time? Light and matter exist as particles; what behaves like a wave is the probability of where that particle will be. The reason light sometimes appears to act as a wave is because we are noticing the accumulation of many of the light particles distributed over the probabilities of where each particle could be. For instance, suppose we had a dart-throwing machine that had a 5% chance of hitting the bulls-eye and a 95% chance of hitting the outer ring and no chance of hitting any other place on the dart board. Now, suppose we let the machine throw 100 darts, keeping all of them stuck in the board. We can see each individual dart (so we know they behave like a particle) but we can also see a pattern on the board of a large ring of darts surrounding a small cluster in the middle. This pattern is the accumulation of the individual darts over the probabilities of where each dart could have landed, and represents the ‘wavelike’ behavior of the darts. Get it? Particles, right. But what are particles? The constituents of what we usually refer to as matter or radiation, i.e the really small pieces that build up the world around us. This branch of science aims at identifying fundamental particles, that is to say particles that are not a congregation of other smaller particles. Let’s take our microscope and make a zoom ! Everything around us is a huge amount of molecules,the smallest amount of a chemical substance that can exist. Molecules are made up of atoms that are stuck together in a particular shape or form. The atom is the basic unit that makes up all matter, and is made of 3 main particles: electrons orbiting around a nucleus where we can find protons and neutrons. To sum it up, let’s have a look at the picture below! The electromagnetic force that links the electrons to the nucleus of the atoms. Hmm, and I suppose that those fundamental forces are carried by elementary particles right? 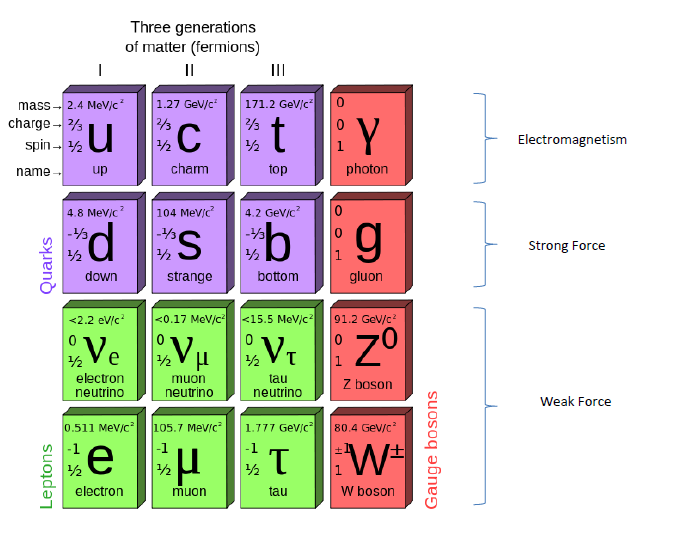 Gauge bosons are carrier particles for three of the four fundamental forces (all but gravity). For instance the electromagnetic force is carried by photons, which are the elementary particles that light is made of. Fermions are the particles that make up matter. Eerh, it is a bit messy, is there a way to sum this up? And why is gravity not included? No, and that is the big problem about it… we have 3 out of 4 fundamental forces explained, but we do not have a precise idea of gravity at the smallest scale. Indeed, as particles’ mass is infinitely small, and as they are close, gravity is really weak at a small scale: looking for it would be like finding a needle in a haystack! Some scientists tried to derive some unifying theories: trying to gather all the fundamental forces under a common concept…unfortunately not successfully! During the 1920s, two physicists, Kaluza and Klein, both observed that it might be possible to represent both gravitation and electromagnetism (the only two fundamental forces known at that time) under a same concept…a space with extra dimensions! Their idea was that in addition to the three dimensions commonly observed, there would exist other dimensions, but these ones would be finite, that is to say not infinitely extended. Uh? How can that be a dimension if it is not infinitely extended? Because it would be curled on itself! Okay, I will give you a small example in 2 dimensions. Imagine a very small ant allowed to move on an very large infinite cable in only one dimension (along the length of the cable). It would not be aware of the small but finite dimension curled around the cable. Well, Kaluza and Klein use the same idea for us: we would evolve in the 3 infinite dimensions, while traversing and experiencing lots of small curled up dimensions! In the theory they developped, they showed that only gravity could be considered as a fundamental force, and not the electromagnetism. How? Well, to keep it simple, when you do the maths on a graviton in 4 dimensions, you get that it splits into two other particles and that those particles satisfy the equations of…electromagnetism! Unfortunately, this theory was not satisfactory due to the same problems arising with the knowledge of gravity: there was no known consistent quantum theory of gravity even in three spatial dimensions, and it turned out that in higher dimensions the difficulty in constructing such a theory was even harder. This theory rose in the 1970s with scientists stating that 3 fundamental forces (electromagnetic force, weak and string force) would be different manifestations of a common origin, by using a strong property of quantum field theory: the behavior of forces involved strongly depend on the energy levels of the particles involved. The essential idea behind string theory is that all of the different ‘fundamental ‘ particles of the Standard Model are different consequences of one basic element: a string. Common sense makes us think that elementary particles like electrons for instance do not have an internal structure… but how can it move ? Well, the reason given with string theory is quite simple : because it is made of a huge amount of tiny strings, so small that even our most powerful microscope would not allow us to observe, and those strings are vibrating ! And so, the same way strings on a musical instrument vibrating at different patterns would create different sounds, these tiny strings vibrate at different patterns to produce a force creating different elementary particles, like quarks, photons, gravitons, etc. So… are you saying that our world is entirely made of strings ? Exactly ! And the beautiful thing about it is that it is the first real unification of theoretical physics ! How ? Well, because with this theory, we state that matter particles like electrons and quarks, and particles involved in the forces of nature, like photons and gravitons, are made the same way, with strings ! Wonderful…but has this been tested ? Well, it is still a work in progress. In the CERN in Switzerland, a large particle collider will be the center of this experiment. It is composed of a very large tube, where small particles are moving at the speed of light towards others in order to create head-on collisions. If enough energy is released, if string theory is correct, then some particles should be « thrown » into those extra-dimensions. To verify the theory, scientists would compare the energy levels measured before and after the collisions : if the after-level is less than the before level, then some particles have been launched into those extra-dimensions ! The problem is in the unification of those forces under a common concept, especially because of gravity: today scientists still do not have a proper idea of quantum gravity… this is where string theory enters the stage! But with great expectations come really difficult mathematics: string theory is still a work in progress, and it will take years to understand if this is leading us somewhere! That’s the beauty of it! Neverending challenges like this is what makes scientists think further and further, and what makes scientific community such a stimulating place to live in! 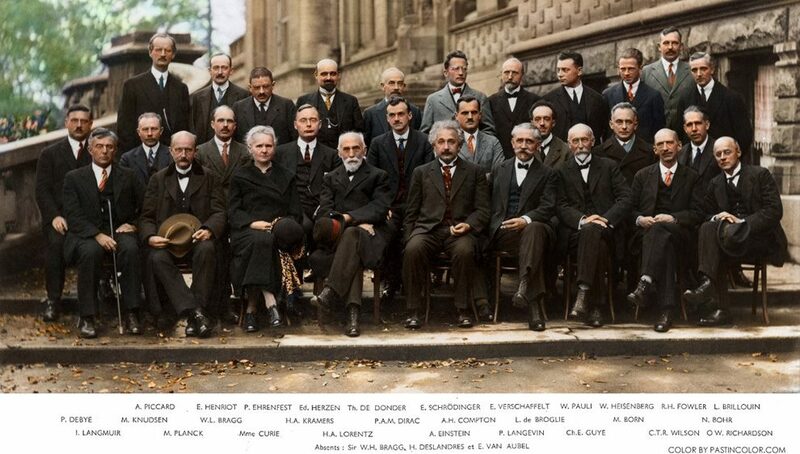 As a proof, I give you the photo of the fifth Solvay conference of 1927, which basically gathered the greatest scientists of the last century.